She's Fantastic: Transformers: Prime ARCEE Miniature PVC Figure! Transformers: Prime ARCEE Miniature PVC Figure! I've been seeing this little figure popping up on eBay from Chinese sellers (listed as a "cake topper") for quite a few months now. I saved it in my Watch list and kind of forgot about it. Then a few weeks ago I finally took the plunge. Not that it was much of a plunge since I only paid a few dollars total. I'm really glad I did get her though because it turns out that she's a very fun and detailed little figure that just happens to be in scale with the Heroes of Cybertron figures from the early 2000s (a massive perk in my opinion). 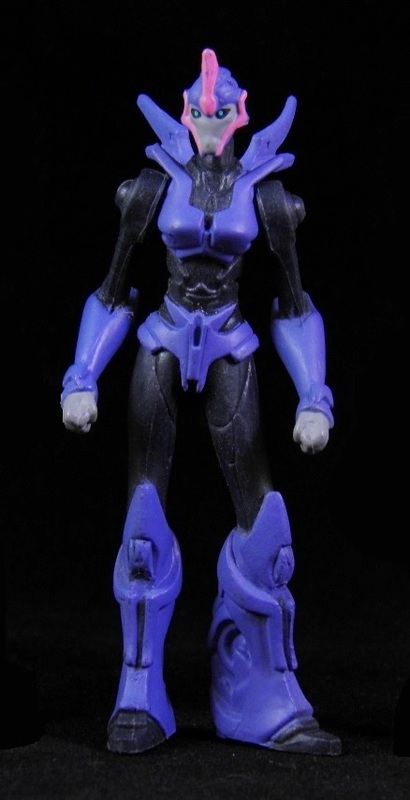 I often find myself pondering why this version of Arcee is getting so much merchandising. I boil it down to the fact that she's finally a headline character. She's surprisingly featured in every graphic for the cartoon. But I also think a big part of it has to do with the fact that she's blue now. As comfortable as toy companies seem to be getting with female characters in "boy" toy lines, I think pink characters will continue to suffer the same old exclusion for many years to come. I'll take what I can get though. Pink, Blue, Polka Dot, whatever. Let's check out Arcee below! My Arcee came loose. I don't know what this figure's origin is. If it's a true cake topper, maybe she'll show up loose in bins ay Party City. I've seen similar figures that end up as pieces in a board game. Who knows. If anyone ever discovers her origins, let me know so I can update this post. Here she is with the Heroes of Cybertron Arcee and Paradron Medic. She fits in perfectly.